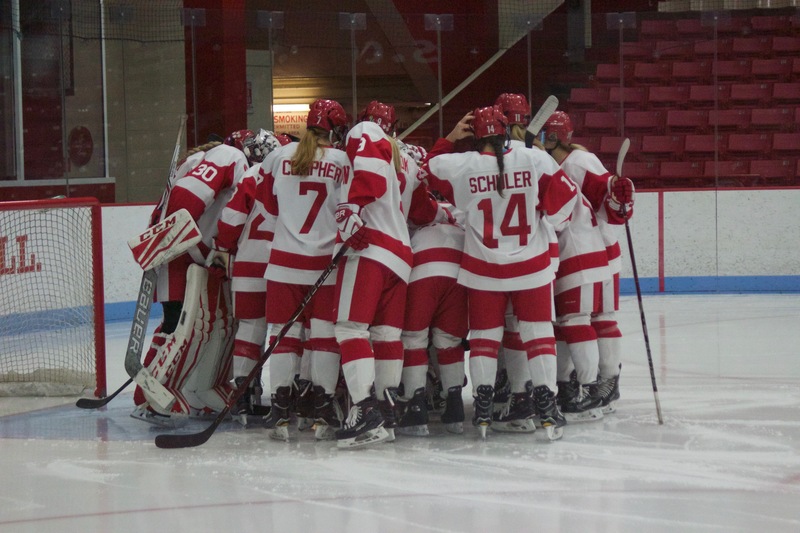 BOSTON, MA — Despite rallying in the third period with a two-goal comeback, the Boston University women’s ice hockey team was unable to get past rival Boston College, falling 4-3 at Walter Brown Arena. The Terriers are now 1-5, tacking on another defeat after having recently ended their four-game losing streak with a 6-2 win over UConn last weekend. The Eagles, meanwhile, remain undefeated on the season, improving to 5-0-1 overall with a 2-0-1 record in Hockey East. Additionally, the result saw BC goaltender Katie Burt set a new WHEA record with her 53rd win between the pipes; Burt also established a personal record, with a career-high 43 saves in the game. BC was quick off the mark in the first period, with freshman Willow Corson converting off a pass from teammate Serena Sommerfie to give the visitors the advantage early. Corson’s fellow first-year Darryl Watts then posted a pair of goals – scoring first with one and a half minutes remaining in the opening frame to double the Eagles’ lead and then again midway through the second period. The 3-0 scoreline lasted only about a minute, as BU’s Rebecca Leslie was able to put the Terriers back in the game. Arriving at the right post, the senior forward slammed home a cross-ice pass from Victoria Bach on a two-on-one with a simple finish just outside the crease. BU’s comeback was interrupted early in the third period when Corson assisted Erin Connolly for the Eagles’ fourth goal of the game. However, the deficit was swiftly reduced once more; with Terrier skaters flooding the crease, winger Mary Grace Kelley managed to sneak the puck past Burt from close range to make it 4-2. The last minutes of the game were incredibly tense, as BU kept continuous pressure on the Eagles, eventually narrowing the deficit to one when Leslie notched her second goal of the game. The strike came on a power play for BU – who had also pulled their goalie for a six on four – with 53 seconds left on the clock. In the end, though, BC held on for the victory. The game was ultimately decided by which team produced genuine scoring opportunities. Although the Terriers finished with a total of 46 shots on net, most of those shots came from well outside the crease and were easily dealt with by Burt. The Eagles were held to just 18 shots on frame but, with their four goals, displayed a shot conversion rate almost 15 percent better than that of BU. The Terriers also mustered just one power-play goal — Leslie’s second tally in the final minute of play — from seven opportunities. “It certainly hurts,” head coach Brian Durocher responded when asked about the lack of power-play conversions. “What sticks in my mind was two of the [BC] penalties we nullified by taking penalties ourselves […] We had some chances and some opportunities where I just felt like, maybe we didn’t get that screen in front of the goalie or maybe we weren’t dogging the net. Despite that detriment, as well as the loss, Durocher was mostly upbeat about the Terriers’ performance, calling the game “an awfully solid sixty minutes”. Next Up: BU faces the University of New Hampshire in Durham on Sunday afternoon. Opening face-off is set for 2 P.M.